In response to the awarding of the 2016 Nobel Prize in Literature to Bob Dylan, reporters and bloggers anxiously mused, "Are song lyrics poetry?" As musings go, this one is wooly and threadbare as grandfather's cardigan, offering little more than terms of exclusion; "Get out of my anthology!" shouts Pop-Pop at the neighborhood kids. A question that yields more insight, but that also takes longer than a blog post to answer, might be "Where is the poetry in song lyrics?" I found myself asking that very question while reading Johnny Cash's Forever Words, a collection of previously unpublished poems and unrecorded song lyrics. Cash, who died in 2003, never rose to Dylan's level of wordplay; hearing the gravelly, God-haunted, and thoroughly human tones of his late Unearthed albums, one suspects Cash wasn't willing to make the devil's barter that Dylan did, sacrificing voice for song. Fair enough. But even if they lack Dylan's sheer linguistic display, might one ask if Cash's lyrics possess the verbal resonance, lapidary phrasing, and suggestive imagery we find in great poetry? In "Don't Make a Movie About Me," Cash warns, "If you don't know my tune you can't get it right," and everything about Forever Words suggests that one needs to know the tune, to be invested in Cash's music in order to be moved by his writings. As his son John Carter Cash admits in the foreword, "When I hold these papers, I feel his presence within the handwriting." The handwriting, not the writing itself. 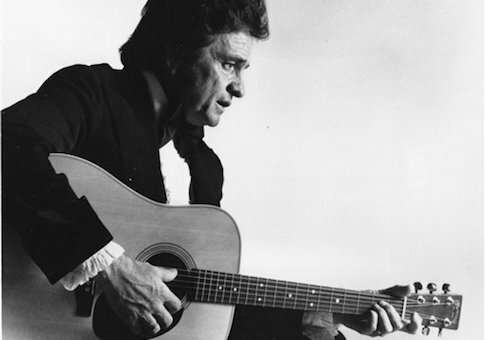 Cash's subjects are various, if familiar from his songs: they include love of God, women, and gold; the misery of addiction; episodes of inexplicable violence; the lives of Job and of Tecumseh; and the ordinary pleasures of hunting and drinking muscadine wine. Cash offers smart-aleck treatments of the pitfalls of celebrity, expressions of alienation and loneliness, and ballads of thwarted romance and romance achieved. He is by turns ironic, lusty, exultant, self-pitying, macho, and gentle, and sometimes he simply wants to tell a good story. And the women in these poems seem not to exist apart from the men in their lives, living only to save them from their own reckless violence ("a kind sweet voice kept haunting him, / Joe, don't take your gun to town"), to lift them up ("I was driving in the rain / Twenty miles from Bangor, Maine / When I realized how much you mean to me"), or to satisfy their many cravings ("Who's gonna grease my skillet / When you're gone"). A few of the works in Forever Words do cover that ground. Maybe not enough to justify the collection, but if you're reading it, you probably already love Cash, so you'll know how to find the poetry that's addressed "not to the wind and stars / But to people's hearts."